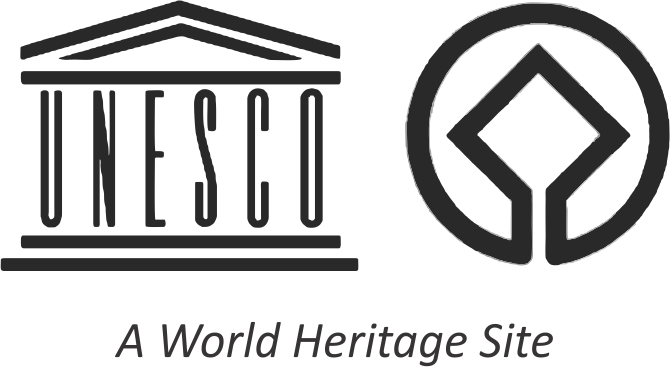 The Great Himalayan National Park Conservation Area Natural Site was inscribed into the UNESCO World Heritage List (2014) for the GHNPCA’s Outstanding Universal Value as a site containing the most important and significant natural habitats for in-situ conservation of Western Himalayan biological diversity, including those containing threatened species of outstanding universal value from the point of view of science or conservation (Criteria X mentioned in the Operational Guidelines for the Implementation of the World Heritage Convention). The complex of protected areas around GHNPCA is a special case because the entire complex is already under consideration for addition to a wider GHNPCA. The collective resources of this complex are not well known quantitatively but are considered complementary to those of the GHNPCA now a World Heritage Site (WHS) rather than competitive. The complex of conservation areas around GHNPCA including Khirganga NP, Pin Valley NP, Rupi Bhaba WLS are yet to be intensely studied; also the units are less advanced along legal pathways required to be fully declared national parks and WLS. Nonetheless indications are they all have high conservation values that would be further defined and confirmed should the comprehensive biodiversity study be completed. GHNP is located within a zone of biogeographical transition along a dual-axis transition zone, east-west and north south axes, accounting for great habitat diversity and unique species composition. GNHPCA offers contiguous and undisturbed habitat integrity, not occurring anywhere in the world. 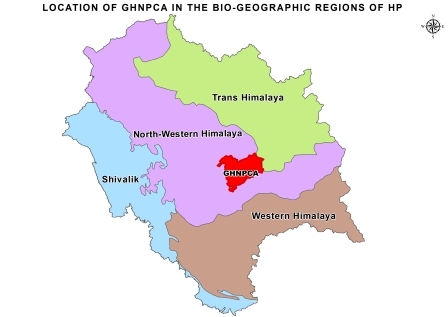 GHNPCA is a single complex, representing east-west (Western and Northwest Himalaya) and north-south (Greater and Trans-Himalaya) elements, which due to its remoteness is facing relatively little human use pressure. 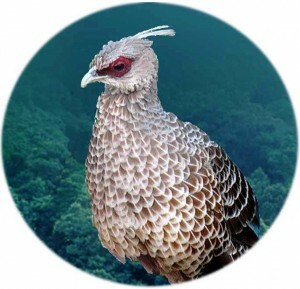 GHNPCA is an excellent exemplar of the full range of fauna and flora characteristic of the Western Himalaya. 58% of the angiosperm species recorded from GHNPCA are endemic to the Western Himalayas i.e. these are not likely to be found in the other sites. GHNPCA preserves large tracts of old growth Himalayan Fir (Abies pindrow) and associated communities holding the highest percentage of plant species that are native to the Indian Himalayan Region. GHNPCA contains one of the last remnant wild populations of Morus serrata, a broad leaf tree confined to Indo-Pakistan subcontinent. GHNPCA supports important and endangered bird species endemic to the Western and Northwestern Himalaya that do not extend into the Central Himalayas. 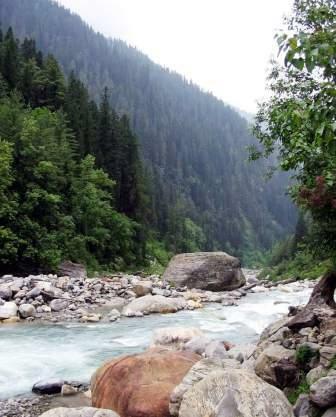 GHNPCA’s most outstanding biological value lies in the well-preserved low-altitude broadleaf and mixed forests, especially in the Tirthan Valley. Elsewhere in the western Himalaya, including such forests are under intense pressure from agriculture, tourism, hydroelectric and other developments. 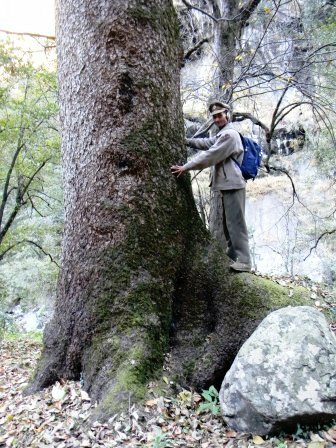 A major survey of biological diversity within the state of Himachal Pradesh considered the GHNPCA area as the best remaining example of low-altitude temperate Himalayan forests in the State: probably in the entire Western Himalaya. 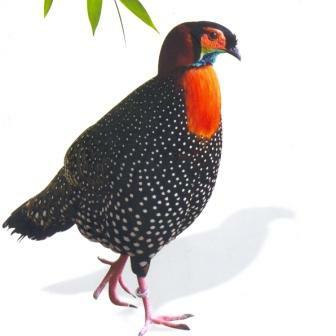 GHNPCA is home to several Rare and Threatened species including the Western Tragopan (Vulnerable Species as per IUCN (Vulnerable C2a(i)), Cheer Pheasant (IUCN Vulnerable C2a(i)), Snow Leopard, Himalayan Musk Deer, Asiatic Black Bear, Himalayan Brown Bear, Himalayan Tahr, Blue Sheep and Serow. GHNPCA is at the center of distribution for the fauna of north-western Himalaya, accounting for higher abundance for whatever species that occur here. Some 25 Threatened IUCN Red-listed plant species are recorded from the park. Comparative analysis undertaken by UNEP’s World Conservation Monitoring Centre (WCMC) concludes that the GHNPCA supports a substantial portion of the species in this Himalaya biodiversity hotspot: 8% of the plant species, 10% of the mammals, 21% of the birds, 7% of the reptiles and 9% of the amphibians. GHNPCA’s biodiversity levels in terms of the habitat diversity, climatic regime and species composition with high abundance match or exceed those of several other high-mountain World Heritage sites including Nanda Devi and Valley of Flowers. The extensive Western Himalayan Temperate Forests in GHNPCA have been identified as a priority ecoregion represented on the World Heritage List only in GHNPCA. It represents a example of a full altitude sequence for the Western Himalaya, possibly the only one available for several of the forest types represented. Unlike Nanda Devi/Valley of Flowers, which does not have potential for further expansion, the GHNPCA is well along in solidifying integrated management of a much larger expanse of related protected areas referred to as the “jewel” of the Western Himalayan landscapes. The Pin Valley NP component of this anticipated expanded GHNPCA has extensive high altitude deserts containing many species in common with Tibet and Central Asia, elements; adding these high desert habitats to GHNPCA will significantly contribute to its altitudinal and biological range and thus make it of even greater value as a representative of the Western Himalayan and trans-Himalayan landscape complex. 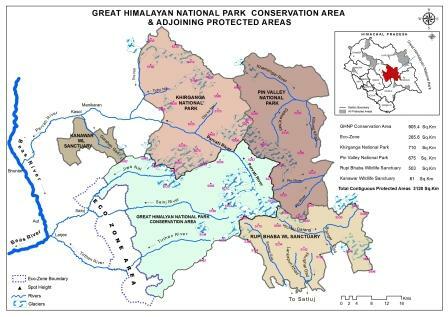 The other protected areas slated for eventual inclusion-Khirganga NP, Kanawar and Rupi Bhabha WLSs will add significantly to the amount of lower-elevation forest habitat in the conservation area, providing additional space for conservation of the unique endemic and endangered species already noted and also provide areas of expansion particularly for mammals and birds originating in the GHNPCA through wildlife corridors. With the onset of global warming and climate change, GHNPCA with its greater number of higher elevation peaks than Nanda Devi (46 peaks over 5000m) will provide more potential species refugia should flora and fauna populations be challenged and stressed and move higher in elevation. The more extensive altitudinal zones in the GHNPCA take on special significance for protecting Western Himalayan biodiversity in the face of fluctuating temperatures and greater variability in monsoon intensity and duration because it offers more spatial/altitudinal “escape routes” for short and longer-term changes in distribution. (For example a recent study reveals that GHNPCA offers the best protected habitat for snow-leopard (IUCN Endangered C1 ver 3.1). With its realistic opportunity for much greater expansion, particularly to even higher and more diverse habitats and watersheds, the future expanded GHNPCA has a significantly higher value than Nanda Devi/Valley of Flowers as a laboratory for the study of global warming and climate change, and for preservation of the biodiversity values from future stochastic and deterministic events. The GHNPCA is the first and only Protected Area in India that was created based on prior systematic and extensive scientific wildlife surveys. 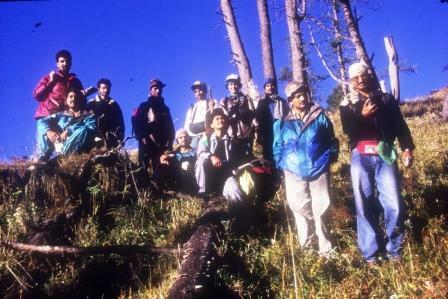 These were carried out in the late 1970s and monitored since then with regular ecological assessments Multi-disciplinary research and conservation projects of the Wildlife Institute of India (1995-1999) make it the only PA in the Himalayan landscape to have such a detailed scientific evaluation of its biodiversity and ecological values, and socioeconomic attributes. The GHNPCA has had a scientific biodiversity monitoring programme in place since 1995, while there is no other PA in the region with such programmes. Existence of this long and extensive data set make the GHNPCA more valuable than Nanda Devi for documenting and analyzing changes occurring in the western Himalaya associated with climate change as well as other human-related factors such as previous resource use. This relative value of this extensive database would only increase if and when the adjacent two NPs and WLS are fully integrated into a wider 2850 sq km GHNPCA, and subjected to additional scientific analysis. GHNPCA protects high density (diversity/extent), intact watersheds of four rivers that originate within its boundaries: (Tirthan, Sainj, Jiwa and Parvati). These four rivers are maintained by multiple snow-fed and monsoon rivers/streams whose upper watersheds are fully protected and are more extensive as compared to any other PA in the region. Relatively benign past and current human exploitation combined with current management restrictions allow GHNPCA fauna and flora to maintain healthy gene pools, which offer resources for supplementing species and populations elsewhere. River systems in GHNPCA are so intact that no invasive species is yet to be recorded in the area. The Himalayan region is signified by a large number of uncommon, endemic and Threatened species of flora and fauna. Varying eco-climatic conditions directly influence the structure and behaviour of the living organisms in this region. The total number of plant species in the Himalayan region is estimated to be 25,000, which is 10% of the world’s known species. This includes 7,020 species of fungi, 1,159 species of lichens, and 2,000 species of bryophytes, with the remainder ferns, angiosperms and other plant species. As a whole, the Indian Himalayas harbours about 50% of the endemic Indian flora. The vertebrates are represented by 218 species of fishes, 74 species of amphibians, 149 species of reptiles, 528 species of birds and 241 species of mammals. Faunal diversity in this region is unique in the sense that they are distinctly different from the species found in the plains, and significant proportions of them are endemic to the Himalaya.